"Super Koopa" is the twenty-sixth and last episode of The Adventures of Super Mario Bros. 3; it aired alongside another episode of The Adventures of Super Mario Bros. 3 entitled "The Venice Menace". In his laboratory in Koopa Castle, Kooky von Koopa, with assistance from Hip and Hop Koopa, is in the midst of creating another invention. Telling Hip and Hop to pull a switch, Kooky watches as energy pulses into a nearby pendant. After the pendant is done absorbing energy, Kooky grabs it and proclaims that with it, King Koopa will gain the same powers Mario and Luigi have and begins to gloat over his genius. As Kooky continues his self-praise, Koopa appears and, after congratulating Kooky, Hip and Hop, takes the pendant, only to be informed by Hip and Hop that it will only function in the real world. Koopa doesn't seem to be concerned with this though, as he will still have the advantage, as Mario and Luigi are unable to access their powers in the real world. While traveling, Mario, Luigi, Toad and Princess Toadstool are suddenly confronted by King Koopa and his Doomship; Koopa proceeds to, with a lasso, grab Luigi and, after traveling a few feet, dumps him and himself into a Warp Zone, with Mario and Princess Toadstool following closely behind; a complaining Toad is told to stay behind in the Mushroom Kingdom by Princess Toadstool. Emerging from the Warp Zone, Mario and Princess Toadstool find themselves in a manhole in Paris, France. Seeing Luigi being held by Koopa, Mario and Princess Toadstool begin to give chase to him. King Koopa, believing now to be a good time to use his power, releases Luigi, zaps a fire hydrant, and kicks it over; amidst the water that flies out is a Super Leaf. Grabbing the Super Leaf, Koopa instantly grows a tail and raccoon ears and, calling himself "Raccoon Koopa", takes flight. Watching in disbelief as King Koopa dives towards them, Mario and Luigi are unable to do anything as he grabs Princess Toadstool and flies-off towards the Eiffel Tower. Landing on the Eiffel Tower, Koopa proceeds to tie up Princess Toadstool and suspend her from the tower. As he finishes tying up the princess, he is approached by Mario and Luigi in a helicopter. Unfazed by Mario and Luigi's sudden appearance, Koopa proceeds to simply knock Mario and Luigi's helicopter out of the sky with one punch. Spinning out of control, Mario and Luigi are fortunate enough to land on a submarine that had raised from the ocean. The captain of the submarine, after exiting the vessel, proceeds to ask if Mario and Luigi are all right. The brothers, however, point out Koopa, who is about to dive-bomb them. Retreating into the captain's submarine, Mario, Luigi and the captain fail to notice Bowser zap a nearby crate with his pendant. Diving into the crate he zapped, Koopa transforms from Raccoon Koopa into "Frog Koopa". Diving underwater, he proceeds to kick the submarine with enough force to beach it on shore, hurting his foot in the process. Climbing on shore, Koopa manages to capture Mario, Luigi and the submarine captain and dumps them in the Bastille. Returning to the Eiffel Tower, Koopa informs Kooky, Hip, Hop and Kootie Pie Koopa through his wand that Paris and all of Europe is now defenseless. In the Bastille, Mario and Luigi begin to bemoan their fate, realizing they're no match for the super-powered King Koopa. As Koopa begins to travel through Paris, becoming annoyed with all the looks he's getting, Mario and Luigi begin trying to dig their way out of the Bastille with a spoon, which Luigi accidentally bends. In one of Paris's shopping malls, Kootie Pie begins trying on outfits, causing all nearby bystanders to faint at her appearance. Inside the Louvre, Hip, Hop and their Para-Goomba minions begin to vandalize all nearby paintings, as well as putting up their own, crude crayon drawings. At the Eiffel Tower, Princess Toadstool, having freed one of her arms, manages to toss a scroll asking for help down below. The scroll, after bouncing a few feet, lands in a manhole and, after traveling through the Warp Zone, lands near an angry Toad. Grabbing the scroll, Toad, after reading it, rushes to Princess Toadstool's aid, after collecting dozens of power-ups and stuffing them in a chest. In the Bastille, Mario, Luigi, and the captain are surprised when their Sledge Bro guard says they have a visitor, who is delivering a birthday cake. The visitor turns out to be Toad in a disguise, and the cake is actually hiding a block inside it. Hitting this Super Block, Mario gains a Super Leaf and becomes Raccoon Mario. Using his new powers, Raccoon Mario busts down the wall of his cell, releasing himself, Luigi and the submarine captain. As Mario, Luigi, and the captain escape, the Sledge Bro. guard manages to call King Koopa, who, after hearing this news, stops his drive around Paris and flies off as Raccoon Koopa. Seeing him in the sky, Toad tosses a Super Leaf to Luigi, transforming him into Raccoon Luigi. Lifting off into the air, Mario and Luigi give chase to Koopa, who manages to smack Mario with his raccoon tail, regressing him back to normal; luckily, Luigi manages to grab Mario before he falls to the ground. At the Eiffel Tower, Toad manages to untie Princess Toadstool and the two toss a Fire Flower to Mario, transforming him into Fire Mario. Using one of his fireballs, Mario hits Koopa, turning him back to normal and causing him to fall into a nearby lake. Dragging himself from the lake, he notices a nearby boot and uses the pendant to transform it into a Kuribo's Shoe (called Karoobi's Shoe), which he uses to chase after Mario and Luigi. During the chase, Koopa uses his pendant to transform himself into a near unstoppable form, combining the powers of a Fire Flower, Raccoon Suit and Karoobi's Shoe together. Blasting Mario and Luigi with a fireball, Koopa transforms them back to normal, only for them to power up once again with a Fire Flower. Zapping King Koopa with fireballs, Mario and Luigi see their attack is ineffective, as Koopa can simply power himself up again after being damaged. Hitting Mario and Luigi with fireballs, Koopa has his attack reflected back at him when Mario and Luigi become invincible through the use of a Starman. Unfortunately, Koopa powers himself up again using his pendant and begins trying to crush Mario and Luigi with a Karoobi's Shoe. Chasing Mario and Luigi, who have Frog Suits on, Koopa notices that Princess Toadstool and Toad have been supplying Mario and Luigi their powers, grabs them, and tries to fly away with them as Raccoon Koopa. Luckily, Mario and Luigi manage to beat King Koopa and rescue Toad and Princess Toadstool. Desperate, Koopa tries to crush Frog Luigi with his Karoobi's Shoe, only to be stopped by Mario, who has his own Karoobi's Shoe given to him by Princess Toadstool. Losing his Karoobi's Shoe, Koopa tries to power-up again, only to see his pendant has overloaded. The pendant then explodes, hurtling him back to the Mushroom Kingdom through a manhole, with Kooky, Hip, Hop and Kootie Pie following him. With King Koopa and the Koopalings vanquished, Mario, Luigi, Toad and Princess Toadstool celebrate, with Toad getting lots of praise for bringing the power-ups to Mario and Luigi. The gray screen that appears when Mario, Luigi, Toad, and Princess Toadstool see Koopa's doomship. Due to a problem with the master tape, the Shout! Factory and N-Circle DVD releases of this episode on the complete series contains many glitches, such as the audio disappearing and the screen turning gray at certain moments. This was not present in the "Koopa Kronicles" or "What a Wonderful Warp" DVD releases. Gray screens appear when Mario, Luigi, Toad, and Princess Toadstool see Koopa's doomship and when King Koopa blows smoke from his nose; the audio glitch occurs when Mario says to the captain that Koopa is hopping mad. When Koopa is wearing the Frog Suit, his shell is displayed whereas in later scenes, the suit covers the shell. When Princess Toadstool and Toad hand Mario and Luigi the Fire Flowers, one of them is mistakenly colored pink, and when the Bros. catch them, both are colored green. When Koopa hits his head in a tree, Kooky is heard despite not being in the scene. 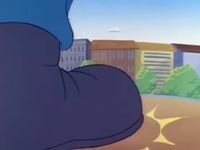 In one scene of the episode, Koopa's Karoobi's Shoe is depicted as blue. Additionally, Mario briefly turns green despite being Fire Mario. Even though Princess Toadstool got her arm free, when Toad unties her, her arm is in her bonds again. Princess Toadstool's bonds change in position and appearance throughout her time on the Eiffel Tower. At one point, King Koopa's raccoon tail is mistakenly colored black and gray. When Kootie Pie says "The shopping," the background is sky, even though she was inside Bowser's Castle. When Koopa notices the boot beside the lake, it is a regular boot. However, right before it grows, a windup key can be seen sticking out of the back. When Mario exclaims to Luigi that there is a block inside the cake, his mouth is not moving for part of the scene. When Kooky, Hip, and Hop are creating the Power Pendant, the top of the table is shown green, but in the next shot, it is shown yellow. When King Koopa comes into Kooky's laboratory, Hop's glasses lens are colored blue. After King Koopa says that Mario and Luigi can't get their powers in the Real World, his eyes are white. This also happens when King Koopa knocks down the helicopter. When King Koopa is holding up the Power Pendant in Kooky's laboratory, the handle is colored green. When Mario, Luigi, Princess Toadstool, and Toad spot the Doomship in Grass Land, Princess Toadstool's broach is colored incorrectly. When Mario says "He's shoving Luigi into the Warp Zone!!" Princess Toadstool is shown floating. In a lot of shots of this episode, the top of the Eiffel Tower is shown bent. It is strange how King Koopa drops the Power Pendent when zapping the fire hydrant, but immediately gets it back later in the episode. 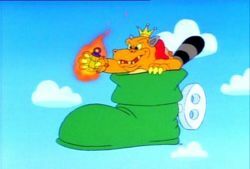 When King Koopa was using the raccoon power to fly at the beginning of the episode, he was not shown holding the leaf. When Mario and Luigi were in the helicopter, Mario is shown holding a megaphone, but in one shot, he is not. In this episode, King Koopa gets a Super Leaf and becomes Raccoon Koopa, but when he dive bombs Mario, Luigi and the captain, he has no raccoon ears. When Frog Koopa was attacking the submarine, Mario was shown smiling. When Frog Koopa is angry because he hurt his flipper, his eyebrows are disappearing and reappearing. When Frog Koopa is talking to the Koopalings on his wand, the light around the wand is flashing. When Frog Koopa is talking to the Koopalings on his wand, Kooky's head flashes orange. When King Koopa sees the people, the people teleport. When King Koopa sees the people, his wand is whiteish, yellowish, with blue on top, but when the people get scared away, his wand completely changes colors. When Kootie Pie is shopping, parts of her hat are yellow like the rest, but in the next shot, it is shown purple. When Hop is painting his own picture, a line just appears on his picture. The same thing happens when Hip is painting whiskers on the Mona Lisa. When Princess Toadstool throws the scroll from the Eiffel Tower, the manhole is shown colored yellow and orange. This also occurs when King Koopa flies in. When Toad grabs the scroll, the background is shown dark purple. When Toad stuffs all the power ups in the chest, he is strangely jumping on them. When King Koopa says "Escaped have they!!" Hop's glasses are mistakenly colored red. When Toad says "Is it a plane!?" he face is messed up. When Toad says "Luigi!! Catch!!!" the chest of power ups is shown empty. In some shots of this episode, the chest is shown full of green blocks instead of power ups. In one scene, the chest is by the cell. In the next, it is suddenly by the Eiffel Tower. After King Koopa falls into the water, Mario weirdly shoots a fireball. During the song "My Karoobi" the music immediately stops for a few seconds. When the Koopalings are jumping into the manhole after King Koopa, Kootie Pie is shown double jumping. Toad bringing the treasure box filled with power-ups to Mario is a reference to the Toad Houses. The unhappy expression of the French submarine captain when he mentions Frog Suits is a reference to "frog", which, when used to refer to a French person, has a disparaging meaning. This is the final episode in the Mario cartoon trilogy to feature Toad, the real world and the Mushroom Kingdom. This page was last edited on April 5, 2019, at 06:36.